A late start for us leaving the overnight mooring at 9.30am. It was overcast with a slight chill in the breeze so it was the first time we’ve worn our woollen hats since April. As it was the last day aboard for Daniel and Joyce he took control of the tiller. I went below and worked on the laptop until just past Barby Moorings when I re-joined him for the last stretch. I can’t remember whether the bridge in the following photo has been rebuilt since we were last this way in June. But work has obvious been completed recently. Just after Barby straight we caught up with another boat that was going considerably slower. Actually we dropped back to tick-over to maintain the same speed. 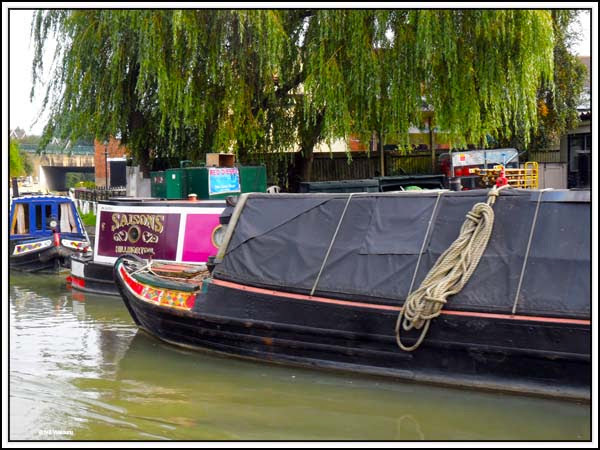 There were boats either side of the canal at Hillmorton Wharf and Daniel found himself attempting to negotiate a passage without hitting any boats. 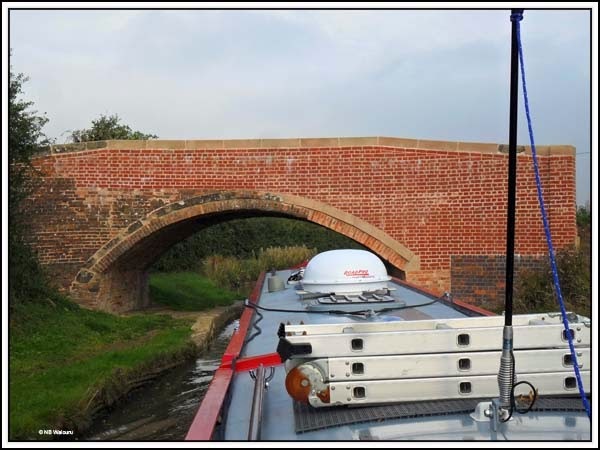 Continuing on behind the slow boat ahead we reached Hillmorton Locks (3) which are paired. The boater ahead naturally chose the fuller of the locks which is exactly the same decision I would have made. However he then proceeded to assemble his folding bike. As I walked past him a comment was made about us being a speeding boat with the inference we were doing something wrong. My initial intention had been to raise the paddles on both locks for him but had a change of heart after being slightly offended by the remark as we hadn’t been speeding. They could work their own locks! We were well ahead of them by the second lock and I had overcome my initial displeasure over the remark so I set both locks. There was a lock keeper at the bottom lock, however he could see I didn’t need any help setting the lock. I asked if he had been busy and apparently it had been very quiet with only seven boats that day. We found a vacant spot at Brownsover opposite the 24 hour moorings and went to the cafe in Tesco for a final lunch with Daniel & Joyce. Unfortunately it’s now a Costco with no hot food. We last ate here in 2005 so things have obviously changed. A quick search on Google Maps reminded us there was a Harvester on the other side of the canal. After lunch Joyce & Daniel packed their bags and I accompanied them to Rugby Railway Station where they managed to catch the 2.53pm express train with 10 seconds to spare <phew>! They will be on the Eurostar heading for Belgium as this is written. It was lovely of them to find the time to make a detour on their way back from New york to come and visit us. Hopefully we’ll see them again.